CEA Technologies uses Green Hills Software's INTEGRITY RTOS, MULTI IDE, Green Hills Probe and networking middleware to develop the fully-digital CEAFAR Active Phased Array Radar. 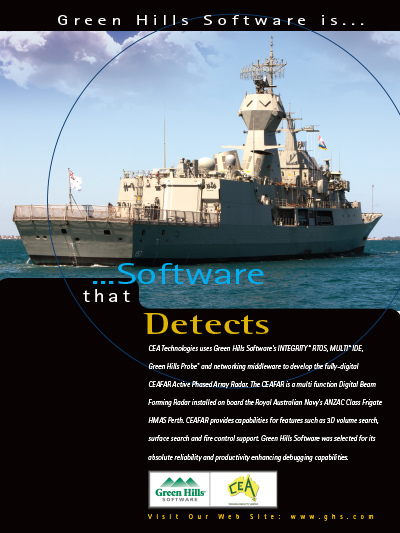 The CEAFAR is a multi function Digital Beam Forming Radar installed on board the Royal Australian Navy's ANZAC Class Frigate HMAS Perth. CEAFAR provides capabilities for features such as 3D volume search, surface search and fire control support. Green Hills Software was selected for its absolute reliability and productivity enhancing debugging capabilities.